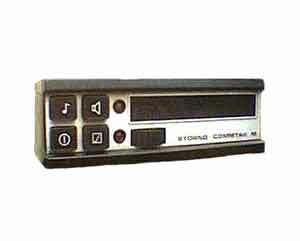 The Storno CQM5000 was introduced in 1979 with single, 2 or 6 channel crystal control and optional 5-tone ZVEI or CCIR selective signalling. The first units off the production line impressed with their excellent sensitivity and transmitter output power (Early 25W models could easily be wound up to over 40W although this feature was 'tamed' in the later production models). Another impressive trick at the time was that the selective calling still worked when the input signal was reduced just below the squelch threshold. The CQM5000 was designed for cost effective production, moving away from the discrete modular approach of previous models. The bottom half of the set was the RF side consisting of a double-sided printed circuit board containing all the receive and transmit circuitry with a solid multi-sectional screen which fitted over the entire transmitter and oscillator area of the board. On the top side was the interconnection board with space for any tone modules plus the oscillators and another screen in the case of multi-channel sets. Most notable was the lack of wiring, being totally conectorized with the exception of two orange wires feeding the front panel loudspeaker. The CQM5000 saw the introduction of broadband transmitter power amplifier design which also simplified production by reducing transmitter alignment time. 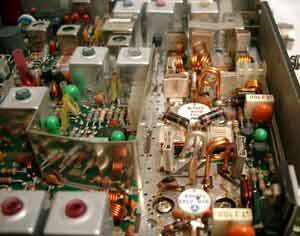 Improved crystal specs allowed transmitter modulation to be achieved by direct modulation of the oscillator crystal with varicap diodes. This had the side effect of reducing the number of frequency multiplication stages required, again simplifying alignment although with multi-channel sets although it meant a modulation adjustment for each channel. Despite the success of pin diode TX/RX switching introduced in recent models, the 5000 employed a straight forward relay. 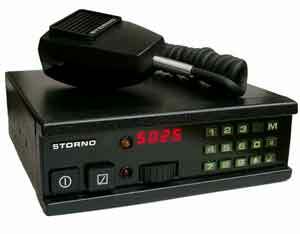 The CQM5000 was introduced as an off the shelf, black box design and on the face of it, looked less versatile when it came to custom sytstem use but there was always something within the spirit of Storno that meant it was soon being moulded and modified to do exactly whatever the customer wanted. Once the synthesised CQM5000S versions accompanied by ever more advanced tone and control boards were developed, it soon became a system radio to equal any of it's predecessors, so much so that eventually a simplified back to basics model was re-introduced bearing the Commtak M brand. The Toneswitch one was driven by the requirement for mobiles with keypad selective calling and status entry requirements. These features were starting to be used by the newly evolving microprocessor aided dispatch systems such as the Storno Micropad. 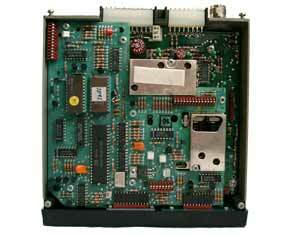 The tone module used a diode matrix PROM to program the tone sequence but did not have the more advanced facilities such as automatic repeat tone insertion. Although synthesised radios had been around for a while, the number of channels above which it became more effective to go synthesised was steadily reducing. The crossover point came when PROM's started to be used to select the synthesiser division ratios. The flexibility to change frequencies or add channels just by programming spelling the beginning of the end for crystal controlled sets. The Toneswitch two was one of the first fully microprocessor controlled mobiles, advertised as allowing up to 99 channels (actually you could squeeze a hundred in if you enabled channel 00 !) 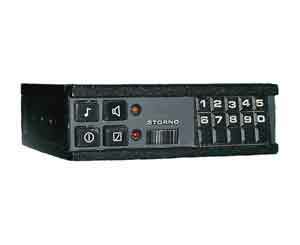 and supporting a wide variety of tone options, the TSII had a standard 4-digit display and 15 button keypad which could be configured to support a wide variety of systems, including CAF2004 (which suddenly sounds quite up to date again now). 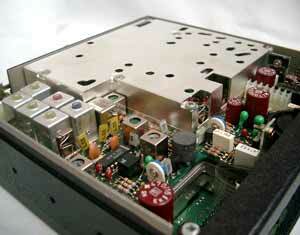 Commtak was originally the product name of the 5-tone based community repeater system. 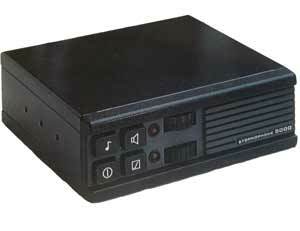 The Commtak M mobile was a single channel only CQM5000 with a simplified front panel aimed at the low cost community repeater system user. This version could only be supplied as a no frills model. 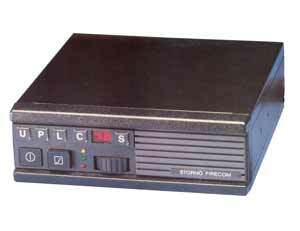 The next development in selective calling was the introduction of 1200 Baud FFSK binary signalling. This spawned a range of options ranging from transmit only Vehicle Identification systems, flexible addressing and status reporting and onwards to early 'digital' trunked systems. 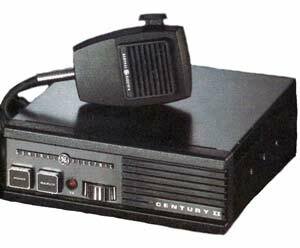 The CQM5000 series was produced during the period Storno was owned by GE and a Stateside version of the unit was available called the Century II.